Manash is one of the founding members of Chase India. 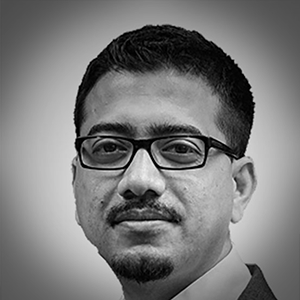 A policy and government relations expert in the areas of security, energy, digital and tech industries, Manash has significant expertise in the critical issues affecting these industries. He has extensive knowledge of the relevant regulatory processes and stakeholders. This allows him to effectively assist clients in engaging with the federal and state Governments, public sectors and various other agencies. Manash was instrumental in founding the organisation after a successful career spanning 12 years in media advocacy and communication. Manash has worked closely with various members of parliament across parties and also served as their lead campaign managers. This helped Manash gain valuable insights into both the Indian parliament and its decision-making procedures. With expertise in government relations, advocacy and senior media relations, Manash has the ability to execute assignments in tight deadlines. He has been running successful campaign for various Fortune 500 companies. Manash has a vast knowledge of running national and global programmes, with a deep understanding of issue/crisis management. Prior to Chase, he was with Ogilvy PR and started his career with Good Relations (I).